Have you ever said “I am too busy” or “I need to get this done, but I just don’t have the time”? You’re not alone. It is a serious problem that affects just about everyone in a small business at some point and proves that staying focused is something a lot of people struggle with. When you’re running a business or working for a small company, a lot is riding on you. If you don’t have the right amount of focus, you can end up failing to get the big picture stuff done, come to meetings with your team or customers unprepared and waste time jumping from task to task. Keep this up, and you’ll feel stressed because you’re not completing what you set out to achieve, as well as feel ungrounded, and failing to reach your goals. If you’re anything like me, how you feel about your work largely depends on your productivity. The stress of a growing task list and missing deadlines can rob you of motivation and make you want to give up. On the flip side, checking a task off as completed and hammering through your Worklist gives you a boost that lasts and makes the hard work worth it. Over the years of using Daylite, my workflow has evolved to help me get that boost by getting more done. Here is my latest workflow that helps me stay focused, build momentum and stay motivated. Review meetings I have scheduled for today and confirm that I’ve completed the tasks related to my meetings so that I come prepared. 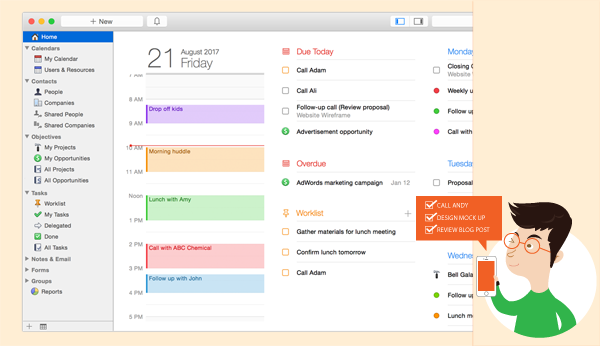 Review my Overdue, and Due Today tasks, projects, and opportunities and schedule time in my calendar that I’ve dedicated to working on these. Add 1-3 of the most important tasks to My Worklist, so I know to put particular importance on them. Review the meetings, tasks, projects, and opportunities that are due in the next few days and if I have the bandwidth, dedicate time to work on these. By going through this process every morning, l’m confident that I can be successful. I am planning my day proactively and not simply reacting to the various things happening around me. While I do have a plan, this doesn’t mean I blindly go to work on my task list and go to meetings. Since my mind is primed on what I need to do, and what impact it will have on my week, I can self-regulate better and avoid getting off task, or I can change my priorities as needed. I can quickly ask myself “Is this more important or just a distraction?” If there is something that needs to be done, but not right now, I can create a new task in Daylite, so I remember to complete it later on down the road. This is the kind of flexibility better focus gives you. At the end of the week, I go through the same sort of process and see what is coming up for the following week. Review any tasks that are overdue, and prepare time next week to complete them. Review the appointments, due tasks, projects, etc. for the coming week and visualize which days will go long, which days will be more busy, which will need an early start, or more travel, etc. Schedule any appointments, meetings and create new tasks if they are needed. Move meetings and appointments around to fit my schedule better. The idea is to focus on the big picture and make sure that you are creating any tasks, projects, meetings, etc. ahead of time. This way your week is already prepared, giving you more focus. Try this workflow for a week and start your day, and end your week with more focus and see how much more you can get done.